Allan Mcdowall and Fay Fife, aka Countess Of Fife. Photo: Liz Tainsh. 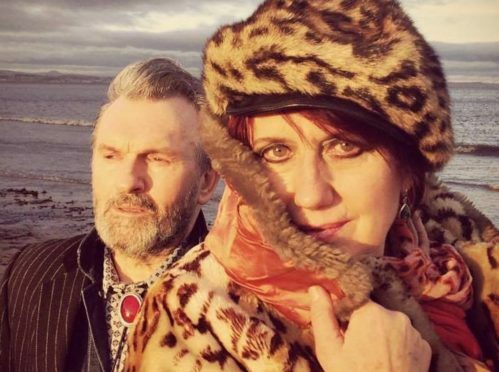 Rezillos frontwoman Fay Fife and guitarist Allan Mcdowall are bringing their Edinburgh-based band to Dunfermline’s Fire Station Creative on March 22, with support from local duo The Cognac Twins. Formed in 2016, COF are gaining traction following a recent support slot alongside the capital’s Filthy Tongues, with Dunfermline-born Fay saying they’ve deliberately taken their time stepping into the spotlight. “When we started we had no real intention to do any shows,” she explains. “I was quite busy with The Rezillos so we just thought we’d make this primarily a writing project. We did one or two low key refugee benefits in Edinburgh because they’re a good cause and it allowed us to develop material in front of an audience. Fay says COF’s innovative brand of “insurgent country” takes in a host of disparate influences. “We’re not overtly country — it’s got a country slant to it but it’s also punky in that most of the songs are intentionally raw and edgy,” she adds. “If it’s going to get too smooth we get it out and go back to the basics. The music I love from all genres is very earthy and raw and we want to have freedom lyrically. Some of that’s appreciating not the real raw emotion you get from country music but actually the quality that gets a bit corny, and being aware of that and slightly utilising that. According to Fay, work on the band’s self-produced debut album has been a slow process — but with good reason. “We’ve made inroads into recording three-quarters of it but we’ve a philosophy of keeping things in real spaces and going with a natural sound,” she says. Far from the jaunty pop-punk of The Rezillos, COF’s songs look seriously at subjects like death and — as with Your House Is Full Of Baby Dolls — social alienation and dysfunctional relationships. A full set of COF material is guaranteed at their upcoming show — with Rezillos work strictly off-limits. “We’ve more than an album’s worth of material and don’t go anywhere near any of my old catalogue — that just wouldn’t ever happen in a million years,” says Fay, who’s recruited drummer Nora Noonan and bassist Gary Pyecroft. “I still continue with The Rezillos — actually we’re playing a festival at the weekend and they’re developing new material as well — but they’re a heritage band and certain things are expected from them. Sometimes I’m happy to do that but sometimes I want to really break out completely. Fay admits to mixed emotions ahead of playing her home town. “When I was a teenager in Dunfermline I was extremely alternative and I don’t think people really appreciated that,” she explains. Tickets for the show are £10 via Eventbrite. *** It’s Sensational Alex Harvey Experience at Green Hotel, Kinross, tonight at 9pm. The acclaimed tribute outfit have worked with their Glasgow idols’ original guitarist Zal Cleminson and have a strong following. Tickets £16.25 from Ticketweb. *** Fast-rising Scottish alt-rock trio Primes play Conroy’s Basement tonight, with support from Dundee’s OHRIO and Fife outfit Ivory Caves. Tickets £6 via songkick.com. *** Iron Maiden tribute Maiden Scotland rock PJ Molloys tonight, with Caithness indie exponents Neon Waltz at the Dunfermline venue on Friday. Check PJ’s Facebook page for info. *** Aberdeen-based blues rock quartet Gerry Jablonski Band hit Kinross’s Green Hotel on Friday. Tickets £19.40 via Ticketweb. *** Bonfest openers Cherry Bombz play a bumper set of classics at Beat Generator tomorrow, with rocker Joe Digan DJing until 2am. Advance tickets £6 from Grouchos or the band. *** Number 57 has Chain Gang tomorrow then Bedrock plus an open jam on Sunday.